The Case is not being created. If I take out the JJ_Anonymous__c from the two relevant lines, the Case is created fine. But somehow adding JJ_Anonymous__c breaks something. I have tried setting the value of the input field for anon to both “1”, as shown above, and “true”. It does not seem to make a difference, it still fails to create the Case in both instances. @hamayoun, you said that when you take out the reference to your custom field, the form works as expected. So, it appears that the issue is with your reference to the custom field. 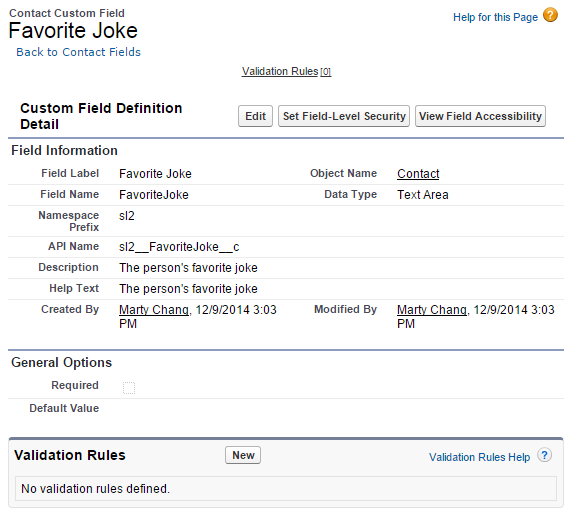 Can you post a screenshot of the field definition in Salesforce? Below is a screenshot showing a custom field I have on a Contact object in my org, and the code below shows a working pre-chat form that accepts any entered value for the custom field. It looks like there may be a problem with the Pre-Chat API or the pre-chat form, where checkbox values cannot be passed as expected into Salesforce. As a workaround, you can bind the input element to a Text field, and then either create a workflow rule or use a formula field to convert the text value into a Boolean (a.k.a. checkbox) value. Another workround would be to use a pre chat controller (which I am already using) and just create the Case there. But it would be good to get it working the "proper" way. Not the answer you're looking for? Browse other questions tagged liveagent or ask your own question. How to pop up contact record on live agent chat accept without pre-chat and Deployment API?